I Taylor fleur de llis within crowned cartouche and below GR, and 179? 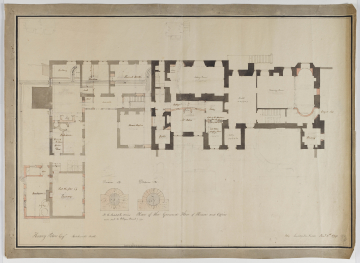 A comparison with Soane's sketch plan () shows that the layout is much the same though the south west room that was labelled Mr Peters powdering room (drawing ) is now labelled 'Boudoir'. Details for the drains have been added, and the runs of pipes are shown (for the offices only). New work is indicated in a light red wash so that the only entirely new office is the washouse. The good quality paper and border suggest that this may have been itended as a presentation drawing.